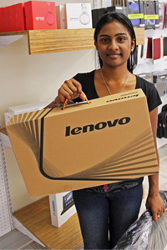 Geared for learning: Engineering student Priyashnie Govender was the first recipient of a laptop through ICTS’s Laptop Pilot Project. Laptops became compulsory this year for four courses at UCT – in physics, chemical engineering, architecture design and theory, and law. And a UCT researcher will be tracking just how useful they are in the learning process. The Laptop Pilot Project began in ICTS, spearheaded by Kira Chernotsky, director of the Customer Services Division. Chernotsky will investigate the merits of making a laptop a requirement for students. The project will provide students with the know-how and tools to study and compete in the electronic age and in the globalised workplace. All students registered for the four selected courses were asked to bring a laptop to class, or to buy one at a reduced price through the Student Laptop Initiative. To ensure that financially constrained students were not excluded, ICTS gave 82 laptops to financial aid students, with 18 going to chemical engineering students, 37 to law, 22 to physics and five to architecture students. These were given on the understanding that if the students drop out or change course, they’ll return the machines to ICTS. They’ll also be responsible for loss or damage. All going well, graduates from the courses will be able to keep the computers. The 500 students participating in the pilot project benefited from hands-on ICT training, and informational materials and useful software, provided on a 2GB flash drive. The Centre for Educational Technology has assigned a researcher to the pilot to examine how teaching and learning is affected by students having laptops. She will also list the practical or infrastructural challenges presented by having so many students with laptops on campus. The pilot will be used to determine what impact a possible university-wide rollout of the programme would present. Chernotsky, who was responsible for initiating the project and procuring funding, said: “This has been one of the most exciting projects I’ve been involved in at UCT. It has the potential to be a real game-changer in terms of how teaching takes place – and in terms of how students learn. It’s only once lecturers can be sure that every student in their course has a laptop (regardless of their economic situation) that they can use technology to fundamentally change the classroom experience. “The level of enthusiasm and co-operation shown by all involved is an indication of widespread support for the pilot.” She hopes many more departments will want to roll the initiative out to their students from next year.